Have you ever heard of Alexander Sarnavskiy? If you haven’t, he’s the talented 20-year-old depicted above. 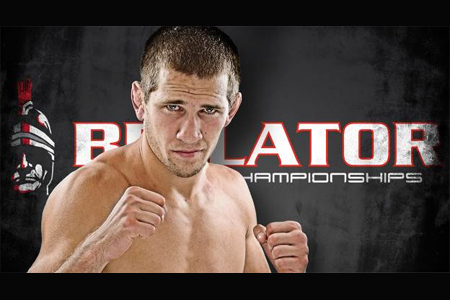 Most stateside MMA fans have never seen the Russian fight, but that will soon change as Bellator has signed the lightweight to its roster. “Alexander Shlemenko has put a high standard of Russian dominance in Bellator by winning two middleweight tournaments,” Sarnavskiy said. “Now my teammate Andrey Koreshkov fights for Bellator as well and he recently won two fights by spectacular KO’s. Vitaly Minakov also just signed with Bellator, and I expect him to become Bellator’s next heavyweight champion. Sarnavskiy is perfect through his first 20 professional scraps and is considered by many as the planet’s top 155-pound prospect. He has finished nine of his last 10 victims before the final horns have blared. “Tiger” is looking to steamroll through Bellator’s Lightweight Tournament and earn himself a shot at the throne. Sarnavskiy’s addition couldn’t have come at a better time for Bellator, as it appears superstar Eddie Alvarez might soon be UFC bound.